This Side Chair offers comfortable and stylish seating for your home. 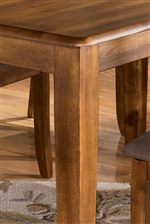 With a rich hickory stained finish and a microfiber upholstered seat, it adds a comfortable place to entertain friends and family around the Drop-Leaf or Rectangular Table. 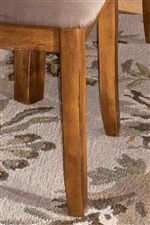 The Berringer Hickory Stained Side Chair with Upholstered Seat by Ashley Furniture at AHFA in the area. Product availability may vary. Contact us for the most current availability on this product.